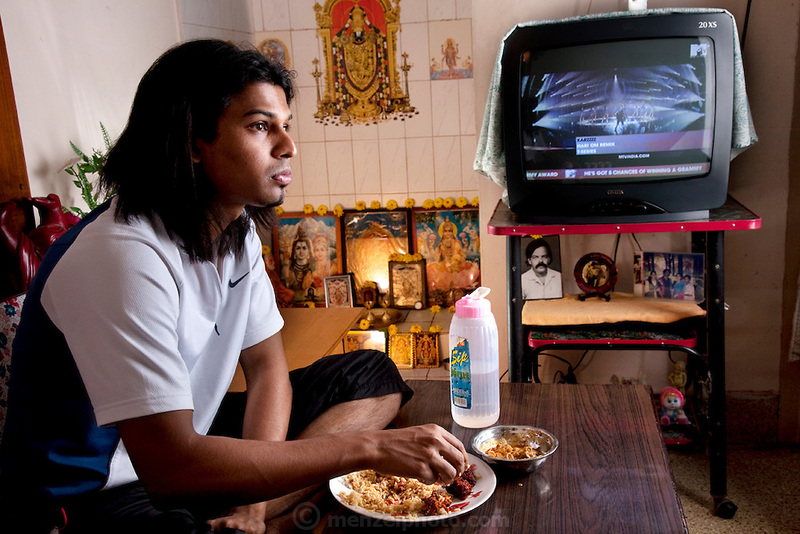 Shashi Kanth, a call center worker, eats a late lunch while watching MTV at his home before going to work in Bangalore, India. (From the book What I Eat: Around the World in 80 Diets.) Shashi loves his mother's traditional southern Indian food at home, but when he's at work his dinner options are KFC and Beijing Bites, the fast-food restaurants on the ground floor of the high-rise where he works, located on the edge of Bangalore. Like many of his co-workers, Shashi relies on quick fast food meals, candy bars, and coffee, to sustain him through the long nights spent talking to westerners about various technical and billing problems. MODEL RELEASED.